・News / Wireless electric trams at Seoul Amusement Park begin full operations.
" Wireless electric trams at Seoul Amusement Park begin full operations. 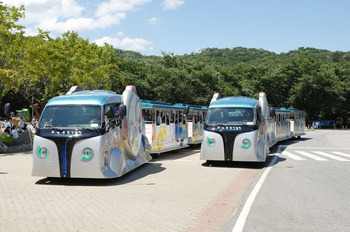 The Korea Advanced Institute of Science and Technology (KAIST) and the city of Seoul held a ceremony this morning, July 19, 2011, to celebrate their joint efforts to adopt a green public transportation system and presented park visitors with the three On-Line Electric Vehicles (OLEVs), which will be operated immediately thereafter. Approximately one hundred people, including science high school students across the nation, attended the ceremony and had a chance to ride the trams. The OLEV project was initiated in 2009 as a method of resolving the battery problems of electric cars in a creative and disruptive way. KAIST came up with the idea of supplying electricity directly to the cars instead of depending solely on the onboard battery for power. Since then, the university has developed core technologies related to OLEV such as the “Shaped Magnetic Field in Resonance (SMFIR),” which enables an electric car to collect the magnetic fields and convert them into electricity, and the “Segment Technology,” which controls the flow of electromagnetic waves through an automatic power-on/shut-down system, thereby eliminating accidental exposure of the electromagnetic waves to pedestrians or non-OLEV cars. ・Power cables are buried 15cm beneath the road surface. ・On average, over 80% power transmission efficiency is achieved. ・The distance gap between the road surface and the underbody of the vehicle is 20cm. ・The OLEV bus has a maximum electricity pickup capacity of 100kW. ・The OLEV bus complies with international standards for electromagnetic fields (below 24.1 mG). The eco-friendly electric trams at Seoul Grand Park consume no fossil fuels and do not require any overhead wires or cables. Out of the total circular driving route (2.2km), only 16% of the road, 372.5m, has the xembedded power lines, indicating that OLEV does not require extensive reconstruction of the road infrastructure. The city government of Seoul signed a memorandum of understanding with KAIST in 2009 as part of its initiatives to curtail emissions from public transportation and provide cleaner air to its citizens. Both parties plan to expand such collaboration to other transportation systems including buses in the future.